NASA recently released this view from up above Rhea, Saturn's second largest moon. The image was taken by the Cassini spacecraft on May 2, 2017. Rhea, an icy cratered moon that provided the first direct evidence of an oxygen atmosphere in the Saturn system, shines in its final image by the Cassini spacecraft. The Cassini spacecraft explored Saturn and its many moons for 13 years before plunging into the ringed planet on Sept. 15 of this year. It was a cooperative mission conducted by NASA, the European Space Agency (ESA) and the Italian Space Agency. The narrow-angle camera on the probe captured this bird's-eye view of Rhea's northern hemisphere on May 2, 2017. 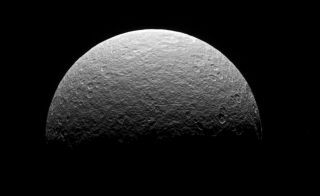 Cassini was "high above the plane of Saturn's rings" when it made its final observation of Rhea at a distance of about 230,000 miles (370,000 kilometers) from the moon, NASA officials said in a statement. Rhea has a reflective surface because the moon is mostly made of ice, maintained by frigid temperatures: Sunlit areas are about minus 174 degrees Celsius (minus 281 degrees Fahrenheit), and regions in the dark can reach minus 220 degrees C (minus degrees 364 F), NASA officials said in the statement. Rhea is the second largest moon in orbit around Saturn, at about 949 miles (1,527 kilometers) across, and was one of the four moons spotted in 1672 by astronomer Giovanni Cassini. Initially named "Saturn V," the moon was later renamed in 1847 to Rhea, the goddess wife of Cronos in Greek mythology. Cronos, in Roman mythology, was known as Saturn. Rhea has an oxygen atmosphere that is about 5 trillion times less dense than Earth's atmosphere. Some scientists propose that the oxygen atmosphere is caused by the icy surface getting exposure to radiation from Saturn's magnetosphere, according to the statement.